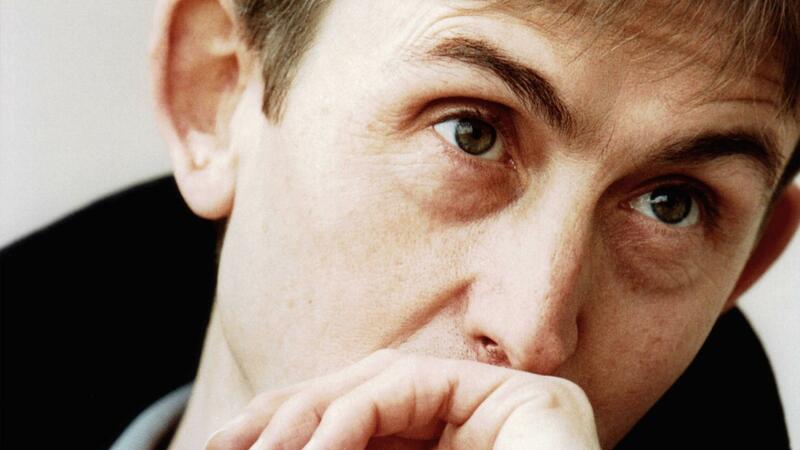 Mark Hollis, photographed in 1998, the year his self-titled solo album was released. The singer and songwriter died in February 2019. The typical trajectory for a rock artist goes like this: Start out raw, risk-taking, totally true to yourself, then gradually get ground down by the industry into making ever more spirit-sapped and radio-ingratiating records. Far less common is the reverse: a career whose public story commences at the showbiz heart of mainstream pop, then torpedoes fame and fortune by embarking on a series of increasingly weird adventures in sound. The paradigm for this unlikely career shape is Scott Walker's journey from The Walker Brothers' epic melodrama to an ever-more harrowing avant-garde solo career. But if anyone has ever rivaled Walker's willed self-exile from pop, that would be Talk Talk, the British group led by Mark Hollis. The singer's death earlier this week at the age of 64 — according to his manager Keith Aspden, due to "a short illness from which he never recovered" — has stirred up a smaller-scale version of the dazed grief and gushing tributes triggered by David Bowie's departure a little over three years ago. Where there are many different Bowies to revere, with Hollis, the basis of the legend is more compact: it's mostly based on the pair of remarkable albums, Spirit of Eden (1988) and Laughing Stock (1991) that form the pinnacle of Talk Talk's five-album catalog. Beyond their immediate appeal — the music's paradoxical qualities of unassuming majesty and gentle might — these albums represent something to the cult that has built up around them over the last three decades through word of mouth and initiation: an adamantine refusal to compromise, to sell short your dreams. When the group first appeared on the British music scene in the early '80s, that endgame didn't seem likely from Talk Talk. It would be misleading to say I vividly remember them, given what a wan and washed-out outfit they were then. But I do faintly recall, from an appearance on the U.K.'s weekly TV show Top of the Pops, watching a nondescript looking-and-sounding outfit hitched on to the tail end of the early '80s synth-pop boom. In those days, Talk Talk was often compared to Duran Duran, whom they'd supported on tour, but their earnest emotionalism was nearer Tears For Fears. On their first two albums, The Party's Over and It's My Life, there's scant indication of the ambient jazz hinterlands they'd shape on Spirit of Eden and Laughing Stock, bar the odd fretless-bass wibble and trace of trumpet. The second album's atmospheric title track, "It's My Life," did become a modest hit in the U.S.A., where it has remained an '80s-format radio staple and spawned larger chart success in 2003 with No Doubt's faithful cover version. 1986's The Colour of Spring featured more limber rhythms and longer patches of languid jazziness. But the sound was still '80s-clinical, somewhere between Peter Gabriel and The Blue Nile. Listening backwards and straining your ears, you can just about make out the seeds of the transformative phase to come. But nobody listening in real-time was prepared for the huge leap — forward, sideways, completely outside the bounds of pop — of a record that trampled over existing fans' expectations and ambushed into admiration a hipper crowd who'd never had any expectations of Talk Talk in the first place. What's so striking and absorbing the first time you listen to Spirit of Eden is the size of the sound, both the depth-of-field (details that seem to be situated across a terraced landscape at different distances from the eye of your ear) and the altitude (the gap between the quietest sounds, which are almost imperceptible, and the loudest, which lash out with clangorous intensity). The music and Hollis's voice paint a picture of a terrain and a man alone in it, with only his anguish and doubt for company. Spirit of Eden, as a title, suggests the pastoral, but this record is not about peace and quiet in a simple, restorative way, precisely because there's a man in its midst, bringing with him all his interior turmoil – the sort of ungovernable emotions and unrest of desire that expelled humanity from paradise in the first place. Spirit of Eden has subsequently come to be seen as a pioneering post-rock album. It's certainly true that, in tandem with Slint, Talk Talk did pave the way for one strand of the genre based around loud/quiet dynamics – the Mogwai/Explosions In The Sky school of high-drama instrumentals. But from another angle, it makes more sense to situate Spirit of Eden not as post-rock but as post-psychedelic. Its bearings really do come from the pre-punk '70s. Both the undecidable quality of the jazzy-folky-bluesy sound and its structuring principles (song form suspended in or dissolving into space) hark back to artists like Robert Wyatt, John Martyn, Kevin Ayers, Caravan. The long tracks (just three on each side) recall albums like Roy Harper's Stormcock; the slow tempos bring to mind the stately feel of Procol Harum or Dark Side-era Floyd. As much as aspects of the album anticipate Massive Attack's Blue Lines, Tricky's "Aftermath" or Radiohead's Kid A, Spirit of Eden would be truly at home in the lost possibility space of the first half of the '70s, when labels like Island, Virgin and Harvest let their artists roam free, confident that a substantial post-'60s listenership was still primed to invest in works of sonic art that unfolded their riches slowly. Hollis himself spoke of the album as fundamentally and perhaps tragically out of joint with its era, describing it as "a reaction" to the constrictions of late-'80s pop. "It's only radical in the modern context," he told Q magazine in 1988. "If we'd have delivered this album to the record company 20 years ago they wouldn't have batted an eyelid." No doubt Hollis had in mind the 1968 of Astral Weeks and Electric Ladyland. Spirit of Eden went beyond invocation of a past era and verged on attempted time travel. Having hired Phill Brown, the Island engineer who'd worked with Traffic and heard his tales about the making of Dear Mr Fantasy, Talk Talk consciously tried to recreate the atmosphere of a night-time recording session in November 1967, right down to working in near-complete darkness. Talk Talk — from left, Mark Hollis, Paul Webb and Lee Harris — performing on the show Countdown in Bussum, Netherlands on Feb. 25, 1986. Also redolent of that late '60s and early '70s ethos of freewheeling jam sessions was the profusion of talents involved as guest contributors (John Martyn's bassist Danny Thompson, experimental musician and instrument inventor Hugh Davies, the choir of Chelmsford Cathedral, to name just a few) and the panoply of hues in the instrumental palette (oboe, bassoon, cor anglais, blasts of distorted harmonica from blues musician Mark Feltham, a breath-controlled synthesizer called the Variophon, and more). At the same time, punk-learned principles of minimalism and non-excess ("restriction is the mother of invention", as Holger Czukay from Can, a band Hollis revered, once said) did work to keep in check the prog-style sprawl of potential decadence. The preponderance of the guest performances ultimately ended up on the cutting room floor, including a hired brass section whose only surviving contribution to the record was the sound of the trumpet player clearing spittle from his instrument. Spirit of Eden was not a straightforward flashback to the prog past, but a reactivation of the all-gates-open ethos of pre-punk rock married with the latest digital technology, with which Hollis and his co-writer and producer Tim Friese-Greene edited and recombined the vast amount of improvised playing generated during the sessions. After seven years in the maw of the music industry, submitting to the promotional grind of videos and photo sessions and interviews, Hollis had arrived at a thoroughly progressive rock attitude to the selling side of the music business, too — a belief that the music is all that matters and it should speak for itself. After humiliating experiences being styled in then-fashionable New Romantic clothes, Talk Talk shunned image and increasingly refused to go along with marketing and promotional duties. An early sign of this stubbornness manifested in the video for "It's My Life," in which Hollis doesn't lip synch the words but keeps his mouth shut tight. Although he succumbed to pressure from their label EMI to do a radio edit and barebones, ultra-basic video for Spirit of Eden's most overtly tuneful track "I Believe in You," Hollis was tormented with misgivings about this decision. Talk Talk was for ears alone, and in that sense broke completely with '80s pop's inherently audio-visual nature. It demanded an older mode of engagement, in both the historical sense and in the sense of being "music for adults." The right way to hear it was aural contemplation of the entire work in a single sitting, ideally listening in the same low light or total murk in which the record had itself been created. In a funny way, it was Talk Talk's earlier, condensed-for-radio, teen-congenial pop that footed the bill for these forays into the space beyond. The commercial success of the first three albums across Europe left Hollis and crew in an enviable position of solvency. The feeling of not being "in the position where I need to make the sort of album other people want any more," as Hollis loftily informed Melody Maker in 1991, carried through to that year's successor to Spirit of Eden. Released on Verve, the jazz imprint of Polydor, Laughing Stock was made following the same process as before, and edges even further into expansive abstraction. And then further retreat: a long gap ensued before another record emerged. Originally intended to be the sixth Talk Talk album and bear the title Mountains of the Moon, it eventually came out in 1998 as a self-titled Mark Hollis solo record, a spare and reduced affair, even less interested in jostling for the attention of the world. Having completed his musical quest for what the European 'chamber-jazz' label ECM called "the most beautiful sound next to silence," Hollis seemed to decide that silence was better still. Apart from a couple of guest appearances (the last being on a 2001 album by Anja Garbarek, daughter of ECM saxophonist Jan Garbarek), he withdrew from the public. There is an honor to that decision. Rather than clutter up the world with a spoor of semi-successful attempts to recapture the magic or half-assed side projects, Hollis decided, or accepted, that he had nothing more to say and opted for the dignity of reclusion. 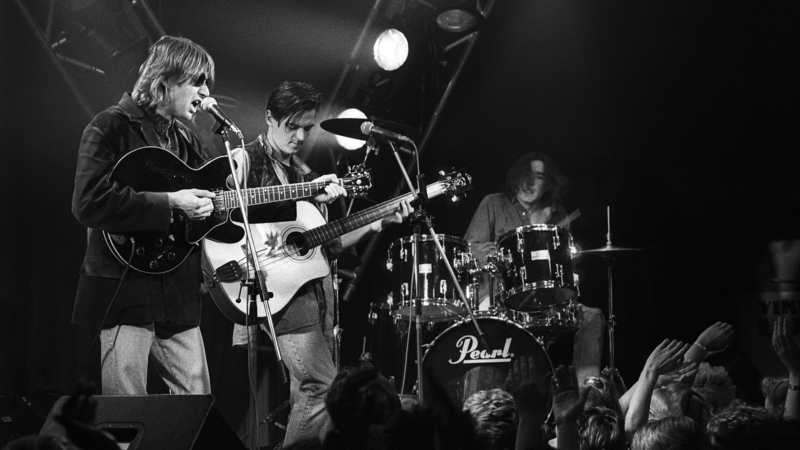 Or perhaps it was that the self-imposed ordeal of making records that required such all-consuming obsessive energy – an experience, especially with Laughing Stock, that members of Talk Talk found traumatic and that ultimately caused them to disintegrate as a band – no longer seemed worth it. As much as their glimmering substance, the attraction of Spirit of Eden and Laughing Stock relates to the narrative surrounding their making. As Creation Records supremo Alan McGee once put it in an op-ed for The Guardian, "I find the whole story of one man against the system in a bid to maintain creative control incredibly heartening." In this tale, Hollis is the heroic figure of unbending integrity who will not dilute his vision. No matter that his prickly perfectionism was probably not always a comfortable thing to deal with in a working situation. "When it came to music, he was never frivolous," Talk Talk bassist Paul Webb told Mojo. "There was a strange energy about him, but it's something you got used to." In an online tribute from earlier this week, Graham Sutton of Bark Psychosis – one of a number of Talk Talk-influenced bands that includes Radiohead, Wild Beasts and Elbow – hailed Hollis for the way he "embodied a certain quiet, rebellious, truly punk spirit." Yet the reactive logic of this punk spirit — breaking repeatedly with calcified expectations and new sonic dogma — ultimately led Hollis and his bandmates to make the least-punk sound imaginable. The fanatical care that went into the recording of Spirit of Eden and Laughing Stock — the limpid production, the teeming of tiny details, the leaps from hushed softness to squalling harshness — have turned these albums into fetishes for a generation of soundheads. But although their audiophile allure is a factor, these albums conquered hearts through their emotional power — the naked ache of Hollis's vocals, the oblique bleakness of his lyrics. On Spirit of Eden and Laughing Stock, two kinds of beautiful emptiness confront each other — the stark grandeur of the soundscape, the desolate neediness of the man alone within it.